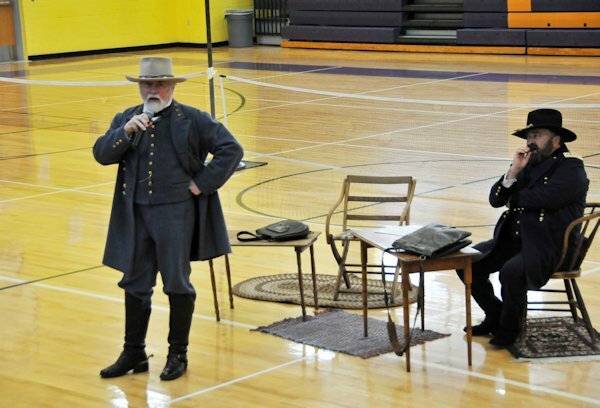 The stage was set for re-enactors of General Robert E. Lee and General Ulysses S. Grant to perform and take their seats at opposite tables in a small setting replicating the home of Wilber McLean at Appomattox Courthouse, Virginia. It's where Lee surrendered his broken army of Northern Virginia on April 9, 1865. These two men (Larry Werline as Grant; Paul Wood as Lee) are so well versed of their characters and similar in looks that you immediately feel you are indeed in the company of those great U.S. Generals of 150 years ago. Students gathered in the bleachers, and most were attentive and some were restless after finishing day long testings in their schools. They won't recall those somber days of Civil War in America that happened nearly 135 or more years before they were born, so it is unrecognizable to these young book scholars and movie goers who have never seen a live battle or such bloodshed as the likes of the Civil War. They would not have known the pain of brothers and friends, sometimes fighting each other in this bloodiest of all wars with more losses than any other war. Over 620,000 killed, and over a million wounded. Sitting back and listening to these two knowledgeable and revered gentlemen was extremely moving as we heard them described bits of their childhood which was similar to students they were speaking to…..then traveling their steps to West Point and eventually into fighting the bloodiest war ever fought. Werline and Wood brought to the forefront, a timeline of events that took students through four years of battle until finally the Confederate forces could take no more, ending their talk to the surrender agreement at Appomattox Courthouse, Virginia. Although it is more than child or adult minds could ever imagine, this presentation seemed as if it were a first hand presentation from the Generals themselves. Grant told students, "I did not want to be a soldier," but explained to students that sometimes you are good at things you don’t necessarily like to do, but you have to do them. Grant's father sat him down to have "the talk" at age 17. He said, "If you haven't had the talk already, you will have it and it will go something like this. "Son, now you can't live here forever and you will soon have to go out and find yourself a job that will support yourself. Now what would you like to do?" Grant told his father, he was pretty good at math and he got good grades, maybe he'd like to do that. So his dad said, "All right son, then I'll go out and try to find you a college." When his dad returned and told him he had found him a college, he asked, "Well, where is it dad?" and his answer was "New York!" Grant said, "New York! that's a long way from Ohio. What college is it?" Grant told students it was really hard to find a college that taught math and science and technology in those days but easy to find law, doctor and nursing schools. "Well, son, it's the United States Military Academy." Grant told students, that at 17, most students know a lot more than their father, so he crossed his arms with chin in the air and announced to his dad, "I'm not going. I don't want to be soldier." "Well, my dad got all squinty eyed and begin to glare at me and with his hand on his hip he pointed at me sternly and said, 'Look, it's free and you're going!" Grant said it was true. It's free to go to a military college for the government pays for it. His dad said he could get his degree and after a couple years leave and go use his degree anywhere he wanted to. So Grant went to West Point. Grant's father often bragged about his son to others where Lee explained that even though his family was related to all the wealthiest land owner families in Virginia, his father was a scoundrel. He was the type that would write a bad check to his best friend George Washington and was sent to debtors prison for two years. Eventually he deserted his entire family. Lee said, "It was my relatives that put our family into a nice home and made sure we had a good education. General Robert E. Lee said he chose to model his life after his father’s best friend George Washington–a man of honor. He studied hard and earned an appointment to West Point. Robert E. Lee was the only General who never received a demerit all his four years at West Point Military Academy and he graduated 2nd in his class. After several years, Lee was offered to be head of the Union Army, but he had heard that his beloved state of Virginia was voting to succeed from the Union and so he hesitated and argued for several hours with his commanding officer. He was warned not to go there, for he will be tried for treason and killed! He said, It was not treason for he had not sworn his allegiance to the Union but he had sworn an oath to honor and protect his home state of Virginia. He would honor that oath the same as he would honor the oath he had made when he married his wife–that he would love her until death. Lee was told he must give his answer right away, so Lee said he would make his decision as soon as he returned to Virginia to see what is going on there and would have his answer right away. When Lee returned home, indeed Virginia had voted to succeed from the Union. He said, "I paced the floor all night long and by morning I told my wife Mary: 'Be prepared to have your world turned upside down.' I wrote a letter refusing the job I had worked 32 years for, and then I left to offer my services to protect Virginia." Grant and Lee continued back and forth in their review of their lives until Grant had won his plea: "No terms except an unconditional and immediate surrender" which he accepted at Appomattox. The 45 minute presentation brought life-like realization to students of the history of this United States and the two great Generals who led the fighting but also came together as gentlemen to heal a wounded nation. Larry Werline as Ulysses S. Grant (Chatham, IL) and Paul Wood as Robert E. Lee (Wheaton, IL) who idealized Lee since youth, have done reenactments for 15 years. They have now formed a group of the famous Generals of the Civil War doing presentations separately or together at schools, museums, libraries, conferences and Civil War Roundtables. If you wish to contact them for a presentation - call Larry Werline at 815-762-5543 or Paul Wood at 630-690-1774. This event was sponsored by Midwest Bank of Western Illinois/Oquawka Branch, Raritan State Bank, Bank of Stronghurst, Security Savings & Loan/Stronghurst Branch, Casey's State Bank/Biggsville Branch, Fort Madison Bank & Trust/Dallas City Branch, First State Bank of Illinois/La Harpe and the La Harpe Telephone Company and Big River Resources, LLC (ethanol plant) West Burlington, Iowa. 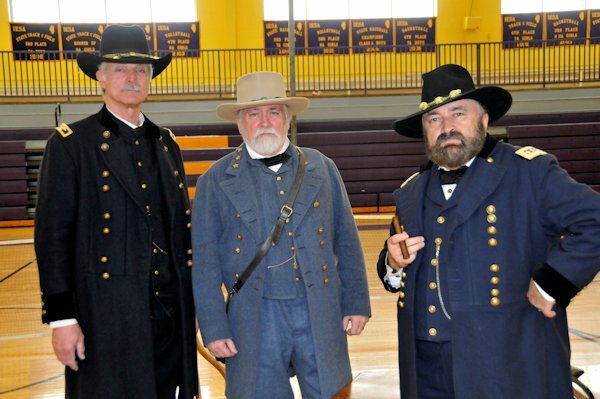 Pictured on Friday, March 15, 2014 are Major Dan Gillett of La Harpe (left) acting as an aid to General Ulysses S. Grant (Larry Werline, Chatham, IL) (right) and General Robert E. Lee (Paul Wood of Wheaton, IL) (center). Gillett made the introductions, setting the stage for the great generals who performed at La Harpe Elementary-Junior HIgh School, West Central Middle School-Stronghurst, and West Central HIgh School-Biggsville. The two famous Generals gave their Perspective On The Civil War starting with their youth, and ending at the surrender of Lee to Grant at the McLean home in Appomattox Courthouse, Virginia. Grant told of his many nicknames formed from his name Ulyssess or U.S. Grant throughout the re-enactment such as "useless Grant" in high school when he made his first (bad) business deal buying a horse, to "Uncle Sam" after he signed into West Point with another name of Ulysses Simpson Grant due to an error in his name by his congressman, and finally "Unconditional Surrender" Grant when he refused to take anything else from the Confederate army.